Meaco Low Energy 20L Review - The Best Whole Home Dehumidifier? 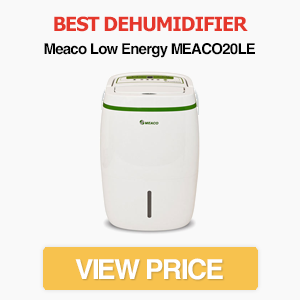 The Meaco Low Energy is one of the best domestic dehumidifiers on the market. It's quick to extract water in warmer conditions and even does a reasonable job as temperatures drop. It also has a large water tank and is highly energy efficient. The Meaco Low Energy dehumidifier is part of the company’s award winning Platinum range. It’s a refrigerant (or compressor) dehumidifier with a 20 litre per day capacity, HEPA filter and large 6 litre water tank. It’s certainly an impressive specification on paper. But can the Meaco Low Energy live up to the hype? And does it extract water quickly? Keep reading our Meaco Low Energy review to find out! 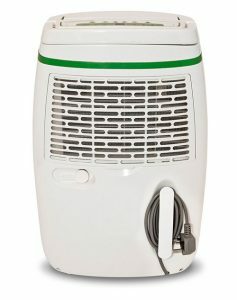 With a simple white and green colour scheme and curved design, the Low Energy isn’t as “blocky” as other dehumidifiers we’ve reviewed. It’s certainly not reinventing the wheel when it comes to appearance, but it won’t look out of place in the typical UK home. It has a motorised louvre that’s located at the top of the machine. This directs air through a wide angle to help dry clothes faster. Air leaves the machine a couple of degrees warmer than it entered, but the Low Energy isn’t going to have a strong warming effect compared to desiccant dehumidifiers. If you’re an allergy sufferer, you’ll be pleased to hear an optional HEPA filter is included with the device. HEPA filters are much more effective at removing small dust particles and allergens from the air than regular filters. Only one is included with the box, so it’s up to you whether to buy replacements. Fortunately, additional HEPA filters cost around £20-£25 for three, so they don’t add a huge amount to the lifetime price of the dehumidifier. The only maintenance required is to clean the filter every couple of weeks. This ensures airflow isn’t restricted and dust is being collected from the air. Meaco recommends using a vacuum to clean the filter. One of the stand-out features of the Meaco Low Energy is the large 6 litre water tank. This is one of the biggest we’ve seen on a domestic dehumidifier, and means you won’t need to empty the machine as often (which is important considering its fast extraction rate). 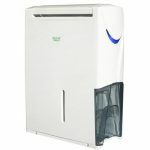 For comparison, many smaller dehumidifiers have a 2 litre water tank. 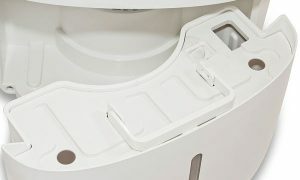 We like how the water tank detaches from the front of the machine, so it can be emptied without moving the dehumidifier. The tank also has a convenient carry handle and a cover to prevent water being spilled. If six litres isn’t enough for you, there’s the option of using a continuous drainage system, although a hose isn’t included. Like most dehumidifiers, the tank includes a simple float that switches the machine off when full. This prevents water spilling over your carpet if you forget to empty it. As you would expect from a refrigerant dehumidifier with a large extraction capacity, the Low Energy isn’t a small device. It has dimensions of 38.5 x 59.5 x 29.0 cm (WxHxD), making it one of the bulkiest dehumidifiers we’ve reviewed. For comparison, our favourite small dehumidifier has a width of around 10cm less and depth of 12cm less. If you’re going to be using it in a small room, make sure you check the dimensions and remember that it needs at least 6 inches space to function best. It’s also a heavy machine. Weighing 13kg, you probably won’t want to move it around too often. An integrated carry handle and easy-glide castors are included though. The Low Energy is a refrigerant dehumidifier. This type works best in warmer and humid conditions. The stated 20 litre capacity, for example, is measured at a temperature of 30 degrees Celsius and humidity of 80%. As temperature and humidity drops, so does the extraction rate. The good news is that the Low Energy provides fast extraction rates in a range of conditions. If your home suffers with damp, condensation or mould, you’ll be amazed at how much water the dehumidifier can pull out of the air in a short time. Unlike many other refrigerant models, it also performs reasonably well in cooler environments – although for a permanently unheated room a desiccant dehumidifier is still probably the better option. Like the Meaco DD8L, the Low Energy comes with the company’s Control Logic system. This allows you to set a target humidity ranging from 30-80% in steps of five. Once reached, the dehumidifier switches to fan only mode to check humidity has stabilised. If it has, it’ll switch off for half an hour, before waking up to check whether humidity levels have risen. If they have, the machine restarts, but if humidity levels are still below the target it sleeps for another 30 minutes. The great thing about the Control Logic system is that it automates the dehumidifying process. You can set your target humidity and leave it running, as it’ll only switch on when required. The system also reduces energy costs compared to running the dehumidifier 24/7. If this is the first time you’ve used a dehumidifier in your home, be prepared for the Control Logic system to be on a lot for the first few days. During this phase, the humidity will quickly drop to a manageable level. Once this has been reached, the tank will fill up much slower and the machine won’t need to run as often. There are also two fan speeds. The lower speed is useful if you want to reduce energy usage further or quieten the machine. A downside is that the Control Logic system can’t switch fan speeds as humidity reduces. This isn’t a major problem, but means you need to manually decide between the low or high setting. With its powerful 20 litre per day extraction capabilities, the Low Energy is perfect for a 3-5 bedroom home. 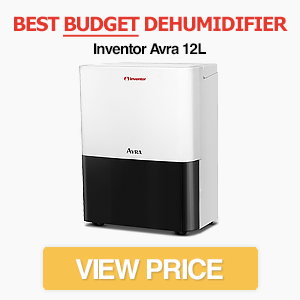 In fact, we’ve listed it as our top recommendation for a whole house dehumidifier. Of course, whether it can dehumidify your entire home without being moved depends on a few important factors. But in ideal conditions it’s capable of lowering humidity both up and downstairs from a single location. The maximum noise output is 46dB. While Meaco calls it a quiet dehumidifier, the reality is that this is around average for a refrigerant model. It’s marginally quieter when on low fan mode, but is never going to be as quiet as some of the desiccant models we’ve reviewed. As the “Low Energy” name suggests, Meaco have put a lot of effort into reducing the energy consumption of the dehumidifier. Considering the 20 litre per day extraction rate (measured at ideal conditions), the 255W power is very low compared to other models. At an energy cost of 15.32p/kWh, the machine will cost a maximum of just 3.88p/hour to run. Meaco estimates that this energy efficiency, combined with the Control Logic system, can reduce energy bills by up to £100 per year compared to other dehumidifiers. While most dehumidifiers claim to be energy efficient, this is a model that can truly backup these claims. Auto restart. If the dehumidifier loses power, it will automatically restart with the same settings you left it on. Off timer. The machine can be set to switch off anywhere between one to 24 hours in the future. This is a useful feature if you want to dry out a room without worrying about wasting electricity, and the 24 hour timer is much longer than most other models. Laundry mode. This mode dries wet clothes faster to reduce the amount of water escaping into the air. Gas defrost. If the coils start to freeze, the machine switches to defrost mode to prevent wasted energy. Meaco offers a two year warranty as standard, with the option of a 5 year warranty. The Meaco Low Energy features a simple control panel. There’s a small display showing the room’s relative humidity at all times, so you can quickly see whether the settings need to be adjusted. Current settings are displayed via small LED lights, and you can adjust these via the electronic buttons. From left to right are buttons for fan speed, a timer mode, adjusting target humidity and a laundry drying option. 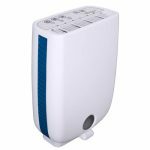 With an RRP of £260, the Meaco Platinum Low Energy 20L is one of the more expensive domestic dehumidifiers. We think it still provides great value for money though. It’s very quick at extracting water at a range of temperatures and is easy to use. The dehumidifier is also highly energy efficient compared to many inferior models, so it’s a case of paying more upfront to save money in the long run. The good news is that it’s often available at a discounted price. This makes an already fantastic dehumidifier a genuine bargain. There’s also the option of choosing the cheaper Meaco 12L Low Energy which has similar features, although it’s less effective at lower temperatures. In a market as saturated with similar models as the dehumidifier market, it’s rare to find a machine that truly stands out. The Meaco Low Energy 20L is one of those models. It excels at quickly removing water from the air and is more efficient than other refrigerant models in cooler conditions. It’s also very energy efficient, due to its low energy design and Meaco’s Control Logic system, and has a huge six litre water tank. 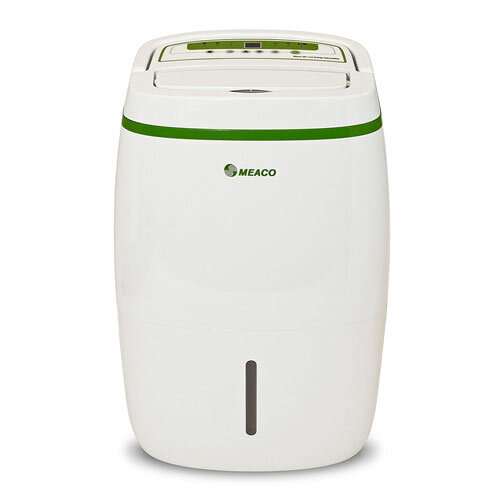 If you’re looking for a whole house dehumidifier, the Meaco Low Energy 20L is our top recommendation. Meaco DD8L Review - Is This The Best Value Desiccant?